Melodeons are very small pressure type reed organs, sometimes called "lap organs," which were built in the United States around 1840 mainly by builders in New England. 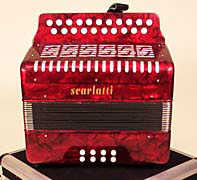 The melodeon is the forerunner of the more familiar pump organ reminiscent of an upright piano case, and was built from about the mid-1840s to the early 1870s. Many of the larger ones looked like the small and typical early horizontally arranged square pianos. Some were actually advertised to be in a piano style case. These are wind instruments with brass reeds to create the sound of an organ. One characteristic of this type of instrument is that it only has one pedal to power the bellows system. The other pedal exists to control the dynamic sound volume. 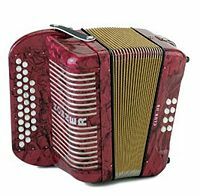 The name "melodeon" was apparently originated by Jeramiah Carhart of Poughkeepsie, New York, in 1835. Being dissatisfied with the bold tone of the wind pressured reed organ that was beginning to become popular, he invented a system whereby the wind could be sucked through the reeds, so that its sounds would project inward into the instrument, rather than outwards. Such a system was also invented by a workman in the Debain shop, around 1835. In 1846, Carhart sold his patent rights and other secrets to several manufacturers, and among them was George A. Prince of Buffalo, New York. By the 1860s, Prince had become the largest builder in the world of these types of small suction type reed organs, offering an astounding 40 different models, ranging from simple instruments with a single set of reeds and just 49 keys, to double manual organs with a larger compass. Between 1847 and 1866, some 40,000 melodeons had been made. They were sold in all parts of the United States and exported to many foreign countries. The city of Buffalo had become "The Melodeon Capital of the World." 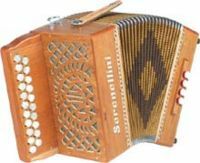 The "improved melodeon," which eventually brought tonal and harmonious music to millions, was invented in Buffalo. Two Yankee artisans, Jeremiah Carhart of Poughkeepsie and Elias Parkman Needham of Delhi, joined the swelling populace of Buffalo around 1835. They immediately found work in cabinet making and carpentry shops in the Washington, Swan and Seneca street area. The patent of this suction principle was secured by Jeremiah Carhart on Dec. 28, 1846 (U.S. Patent Office No. 4912). After years of experimenting and tinkering, this innovative and historic invention finally materialized while Carhart and Needham were in the employ of George A. Prince, owner and proprietor of the George A. Prince & Co. Music Store at 200 Main St. Earlier nineteenth-century reed organs had a raspy, snarling quality and excessive dissonant overtones. The very first improved melodeon was created in the upper floor over Prince's music store. Brisk sales immediately followed its introduction. The Buffalo City Directory for 1847-1948 lists George A. Prince & Co., Music Store, and also "Geo. A. Prince & Co., Manufacturers of Carhart's Improved Melodeons," both at the same Main Street address. Carhart, holder of the patent, had sold manufacturing rights to Prince while in his employment. Carhart and Needham, maintaining their own manufacturing rights, briefly operated a melodeon making shop at 269 Main St, then departed for New York City where, in 1849, they established a melodeon "manufactory" at 77 East 13th St, Manhattan. They continued as a New York-based melodeon and reed organ manufacturer until 1868, under the trade name Carhart & Needham. Meanwhile, manufacturing activity continued from 1846 onward in Buffalo as Prince and his associates, with bold enterprise, added machinery and skilled hands to meet the demand for the ever more popular, moderately priced, and improved melodeon. In an interview published in the Buffalo Commercial-Advertiser on Oct. 11, 1886, half a century after his arrival, Prince recalled that the trip from Boston took him by rail to Providence, by sea to New York and riverboat to Albany, by rail to Utica (in 1836 the western limit of train service), then finally to Buffalo by stagecoach. Prince also recalled, "I had previously worked in the melodeon factory of a man named Abraham Prescott at Concord, New Hampshire" (some 100 miles from Boston). There he had obtained from the crude ideas of his employer "the knowledge that later enabled me, in collaboration with Jeremiah Carhart, to construct the first satisfactory (improved) instrument of its kind." The Carhart-Prince collaboration is now American musical history. Constant experimentation with reeds, bellows, swells and stops led to improved, often patented techniques in Prince's shops. His superintendent of tuning, Emmons Hamlin, developed in 1848-1949 a voicing method that, by twisting the metal reeds, refined the tone markedly. Hamlin later became a founder of the firm of Mason & Hamlin, a large manufacturer of very fine cabinet reed organs and pianos. At a Washington patent hearing in 1860, Hamlin and Needham estimated that prior to 1846, fewer than 300 reed organs had been built in the United States. All were handmade to order in small cabinet shops by craftsmen who also built a variety of other instruments. By the 1850s, reed organs, especially the melodeon, had become a major source of musical entertainment in American homes. As the improved melodeon caught on nationally, the climate for an industry emerged. Newly developed mid-century factory production methods, a widening network of rail transportation to urban markets, relatively low prices, a manageable physical size, plus relative ease of performance, all led to new uses. It found its way into homes, social halls, schools, small churches and even foreign missions and ships at sea. The melodeon went anyplace where pipe organs were impractical. Unlike the piano, the melodeon seldom needed maintenance or tuning, and it was virtually indestructible in normal use. Its fame spread through sales, news journals and trade periodical advertising, as well as in demonstrations both in the home and in wholesale depots, dealer's stores and showrooms. It was suggested that a melodeon in the parlor provided ready musical entertainment, drawing family and friends together for song and fellowship. Soon hundreds of thousands of Americans were acquiring melodeons—a phenomenon not unlike the spread of home television sets during the 1950s. By 1852, George A. Prince & Co. had wholesale depots in New York, Chicago, Cincinnati and Boston. There was also a growing network of agent/dealers in St Louis, Philadelphia, Baltimore, Toronto and other major cities. The market expanded each year. The Prince Co.'s importance as America's pioneer melodeon and reed organ manufacturer is recognized today. American musical instrument historian Robert F. Gellerman, in his 1973 volume The American Reed Organ, notes, "The George A. Prince Co. was the leading manufacturer of reed organs in the United States from the 1850s until the 1870s, and many of the pioneers in the reed organ industry worked for Prince in the early days." Reed organ historian Horton Presley stated in his 1985 book Antique Reed Organs, "The fact remains that Carhart's efforts, and those of George A. Prince, began the big swing to reed organs throughout America." The expanded Prince firm numbered in excess of 200 mostly skilled workers including about a hundred of the best cabinetmakers in the country. Prince's 1860 Illustrated Catalogue states: "We are the pioneers and leading manufacturers of Melodeons in the world," and that "24,000 Prince melodeons had been delivered to the public since the firm's 1846 founding." This meant that around six to even organs per day on average were produced. Competitor Carhart & Needham & Co., located in Manhattan, employed 80 workers in its peak years and had produced a total of 15,000 instruments when the firm closed in 1868. Carhart and Prince developed the pioneering design together and built the first prototype side by side in the same workshop. The small reed organs built in Canada about the middle of the nineteenth century were called melodeons or cottage organs. The larger models, introduced after 1860, were known as harmoniums, cabinet organs, parlour organs, and, popularly, pump organs. Among the first melodeon builders in Canada were William Townsend (Toronto, late 1840s) Hamilton (1853-5), R.S. Williams (Toronto, mid-1850s), and probably Abner Brown (Montreal, 1848-74). The Montreal pipe-organ builder, S.R. Warren, and the Guelph, Ontario brothers, William and Robert Bell, were other pioneer reed organ makers. Their instruments commonly had keyboards of four or five octaves, two small horizontal bellows, and modest foot treadles to pump the bellows. Many came with detachable legs and thus were portable (early versions of the 'missionary' organ); others were larger and heavier, similar in style to the so-called square piano. Canada Organ Co, London, Ont, ca 1865-? John Jackson and Co, Guelph, Ont, fl 1872-3, 1880-3? Mudge & Yarwood Manufacturing Co, Whitby, Ont, 1873-? Edward G. Thomas Organ Co, Woodstock, Ont, 1875-? Gellermann, R.F. The American Reed Organ and the Harmonium. 1997. Gellermann,R.F. The International Reed Organ Atlas. 1998. This page was last modified on 14 September 2018, at 19:19.